To cross or not to cross…that is the question. I could go on forever about the differences between Los Angeles and New York, and I likely will at some point, but for now let’s focus on crosswalks. It may sound boring, but I am fascinated by the differing mentalities between Los Angeles pedestrians and New York City pedestrians. Picture this: A girl from Los Angeles visiting friends in Brooklyn. As we walked through the city, everyone would cross the street at any given time, in any given location without rhyme or reason. The hinderance to crossing occurred when the New York pedestrians begrudgingly waited for cars to pass. It seems entirely logical. However, for the girl from Los Angeles, crossing the street in such a manner was foreign…forbidden really. I’m sure this girl looked like a fish out of water when everyone else crossed the street and she was waiting on the corner for the light. In her defense, she came around quickly. Picture this: A girl from Los Angeles, having recently returned from New York City where she became accustomed to crossing the street the New Yorker way, walking along a sidewalk in Culver City. The girl may have been texting while walking and not really paying attention, but she was aware enough to notice the cars with the right of way driving. She stopped at the crosswalk next to three other people also waiting to cross. Now, not realizing where she was, the girl assumed that she could wait for the other walkers to begin those treacherous steps across the street as her sign to start walking too. She waited…and waited…and waited. Finally, when she glanced up from what she was reading, she realized that there were no cars, there was a green light in the direction she was walking, but no one was willing to move. Why, you might ask. Because that little man that symbolizes “it’s OK to cross the street now” was not lit. The girl looked around and saw the “fear of crossing when not allowed” on other pedestrians’ faces. Taking matters into her own hand, she reached over and pushed the button for the crosswalk. Low and behold, the little man appeared instantaneously and everyone began to happily cross the street. Now, I will never say that (1) New York does it right or (2) I laugh in the face of the law and jaywalk all the time (unless it’s 11pm and I’m walking home alone then all bets are off) or (3) that Los Angeles pedestrians are too timid when crossing the street. No to all of those. I actually think the reason we do not cross the street as willy nilly as those crazy New Yorkers is because there really are police officers ticketing at times (and who wants such an unnecessary ticket), the streets in DTLA are quite a bit wider (at least when comparing DTLA to Williamsburg), and really LA drivers have no idea what to do with pedestrians yet. I get it. However, there has to be a middle ground for us. 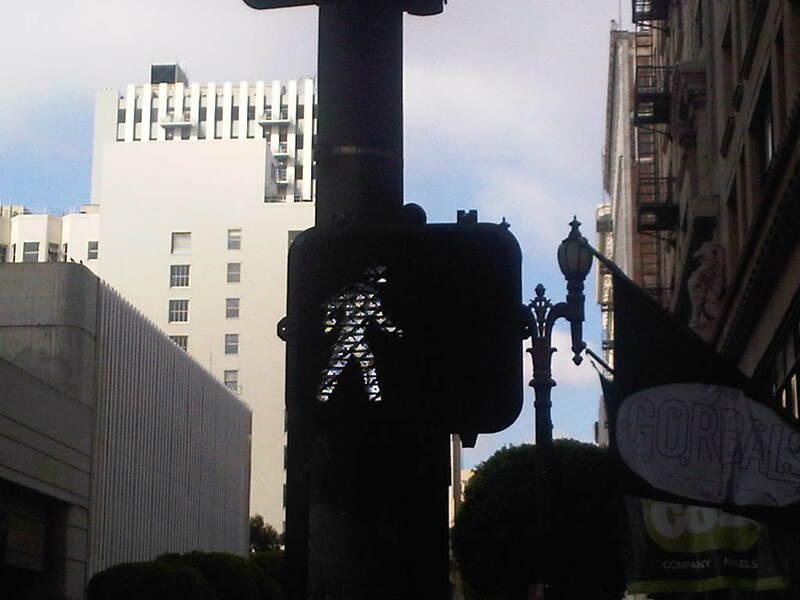 We should be able to cross the street sans the little man symbol granting us permission!